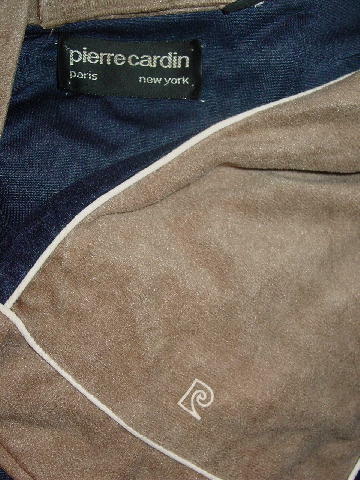 This soft dark blue robe is 85% acetate and 15% nylon and was made in the USA by Pierre Cardin. It has a sandy-light cocoa trim edged on the interior by white cording. 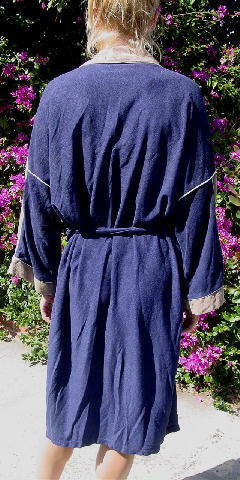 There is a double sided fabric matching belt, double belt loops, 2 front open pockets, and a fabric tab inside the collar to hang the robe on a hook. neckline to end of sleeve 25 1/4"
shoulder to hem 43 1/2"
armpit to armpit 27 1/2"
belt 74" by 1 3/4"